How much did we warm in February? How much has the world warmed since 1979? Summary: The world has been warming. Seldom mentioned is how much it has warmed. Magnitudes matter! The amount of warming so far provides context to claims of extreme weather. For the answer we turn to the NASA-funded global temperature data from satellites. They show the warming due to our actions is small (small so far; the future might be quite different). The truth is out there for people willing to see it. Only with it can we prepare for our future. 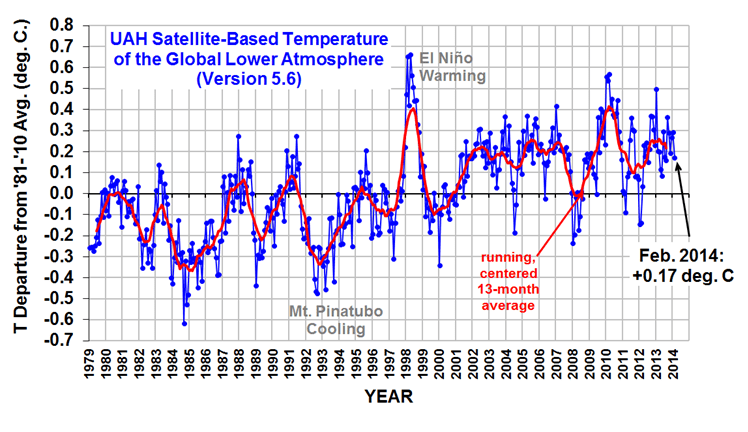 (1) Status report: what do satellites tell us about global warming in February 2014? (Blue is cold; red warm}. Click to enlarge. See the equivalent graph from the surface temperature stations of the Climate Anomaly Monitoring System (CAMS) of the Climate Prediction Center (CPC) at the U.S. National Centers for Environmental Prediction (NCEP). Global composite temperature in February: +0.17°C (0.31°F) above the average for February during 1981-2010. Compared to seasonal norms, in February the coolest area on the globe was over the southwestern corner of Canada’s Saskatchewan province near the town of Eston, where temperatures in the troposphere were about 4.7°C (8.4°F) cooler than seasonal norms. The warmest area was over the Arctic Ocean northeast of Svalbard, a group of islands about halfway between Norway and the North Pole, where tropospheric temperatures were 6.2°C (11.1°F) warmer than seasonal norms. 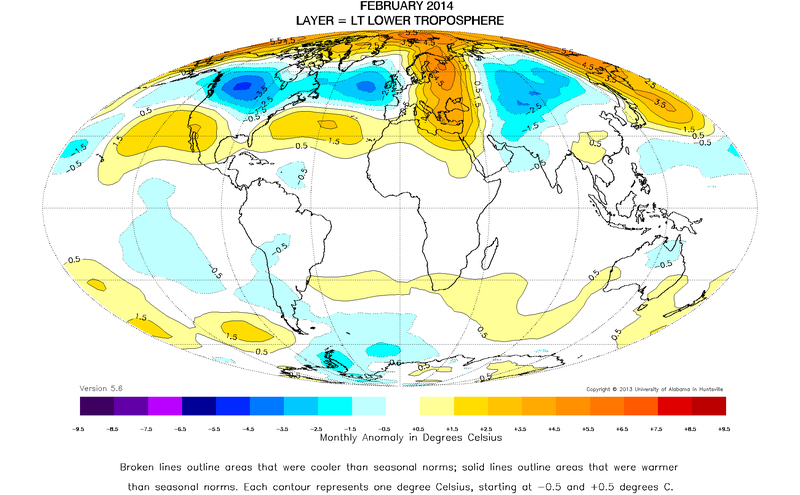 Anomalies are computed per the World Meteorological Organization (WMO) recommended method, comparing the current temperatures vs. a 30 year base period ending with the latest decade. 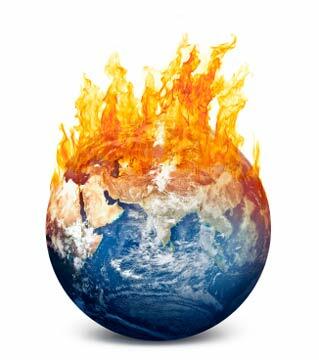 For more detail see Global Temperature Update Through 2013, James Hansen, Makiko Sato and Reto Ruedy, 21 January 2014. Two decades of cool weather, followed by 15 years of warm weather. Wide swings in temperature; a relatively flat trend since 1998 – 2000. For more about the pause see links to climate research in Section 5. (a) From the UAH monthly report, the full record of satellite data (started in 1979). Click to enlarge. (b) A different view of the UAH data, by Roy Spencer, principal scientists on the UAH team (at his website). Earth System Science Center of the University of Alabama in Huntsville. Click to enlarge. 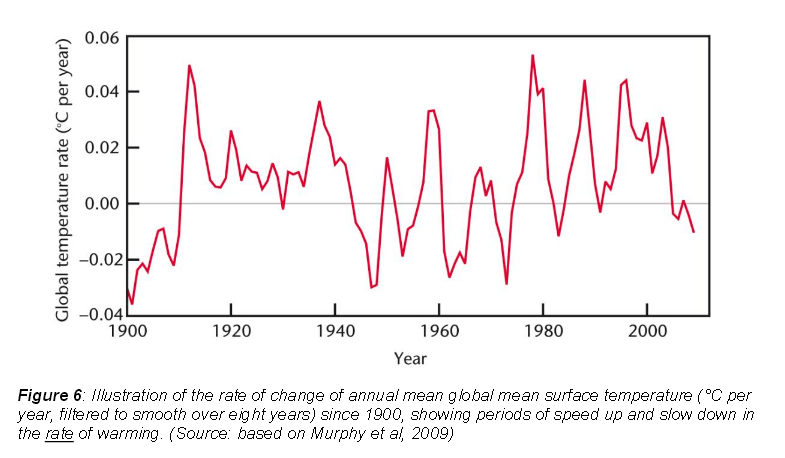 These numbers cannot be properly understood until put in a historical context, as in this graph from page 10 of “The Recent Pause in Global Warming” published by the UK Met Office in July 2013. Q. What do we mean by daily mean SAT? (c) There is a debate about the attribution (causes) of past warming — which probably varied over time — between natural drivers (e.g., rebound from the Little Ice Age, solar influences) and anthropogenic drivers (eg, CO2, aerosols, land use changes). Other that that stated in (b), the IPCC’s reports make few claims about attribution of climate activity. This remains actively debated in the literature: Scientists explore causes of the pause in warming, perhaps the most important research of the decade, 17 January 2014. (d) Warming of the surface atmosphere paused sometime during 1998-2000: Still good news: global temperatures remain stable, at least for now., 14 October 2012. (e) There is also debate about climate forecasts, both the extent of future CO2 emissions and the net effects of the various natural and anthropogenic drivers. More funding for climate sciences. Many key aspects (e.g., global temperature data collection and analysis) are grossly underfunded. Previous Post Droughts are coming. Are we ready for the past to repeat? Next Post Do you know how DoD will spend a trillion dollars this year? 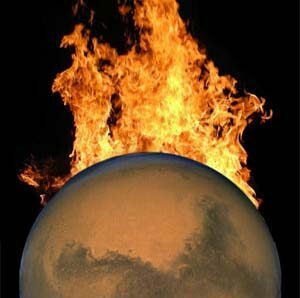 There is more than one type of sun cycle, methane release from the oceans, volcanoes, wild fires, and other natural factors that have much more influence on climate change than Co2 from humans. government wants a revolt which they may want anyway. 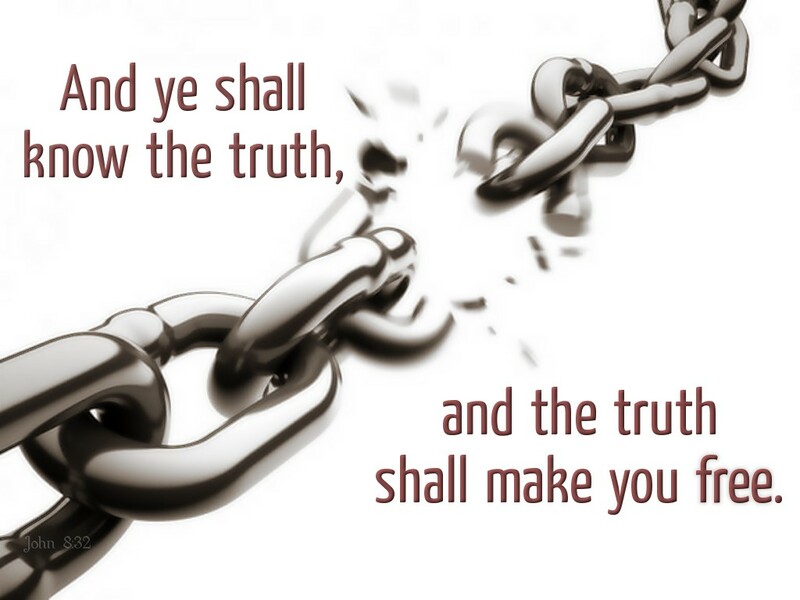 If only we could put the lies of the Right and Left together in a reactor, like matter and antimatter in the Starship Enterprise’s engines, so that they’d combine in a blinding flash leaving nothing behind but energy. Instead posts on vital subjects like climate produce an stream of people indoctrinated with lies by their leaders. Left. Right. Immunized against facts, to accept only approved beliefs. So long as this continues, self-government in America remains a dream. The people who read The Federalist Papers and listened to the Lincoln-Douglas debates are as far from us as the Egyptians who built the pyramids. (1) Burning coal causes huge amount of pollution (over and above CO2). It is probably the single biggest producer of thing like mercury, cadmium (and a whole host of other nasties) into the overall environment. Yes, there is, often forgotten these days, SO2. There is also radiation release, which in total dwarves what nuclear power plants do (even including Chernobyl and Fukishami). This is seriously nasty stuff. (2) The human and environmental cost of extracting the coal. Often forgotten again. Forgotten the exact numbers, but the human (direct) cost of getting coal out of the ground is one of the most dangerous activities known to man. At least a 1,000 die each year (I’ll come back later with the correct numbers which will probably be higher). The water pollution, the (in the US) damage caused by hill topping .. the list goes on and on… I mean this is seriously horrible stuff. (b) those environmental, etc costs are not borne by the power generation (and coal mining) companies. Give a simple example, mining here in Australia gets (at the latest estimate) about $10 billion a year direct and indirect subsidies. Mostly to coal companies. State Govts here subsidise the (virtually all coal) power stations, including the oldest and most polluting coal power station in the World…. to the tune of hundreds of millions of dollars. When we (correctly) introduced our carbon tax … Federal and State Govt then gave away huge subsidies to the biggest coal users… some of them actually made profit out of it…. So, if you did your accounting properly … and had zero subsidies for ANY energy source then the numbers would look a lot different. There is luck on this as to what is the cheapest. Here in Australia solar would (for peak and medium demand day levels) win all the way. If you are in Finland then nuclear is the winner. (c) The kids. Coal is source of hydrocarbons which can be used for chemicals, plastics, drugs and all the rest. All those things that we need. Now if we burn it all, what is going to be available for them in the future? Used properly, sparingly and carefully, coal could provide those essentials for hundreds of years (maybe more) to come. They way we are using it, there will be nothing left…..(note don’t believe all those forecasts about ‘thousands of years of coal’… they are not true). All places need a mix of electricity sources. You cannot just have solar, you cannot just have wind, or just hydro, or just nuclear(etc, etc). You need a mix and your geographical resources will determine the correct mix. But, however you calculate it, and wherever you are, there is zero need now for coal fired power stations. So you can be a ‘climate skeptic’ and still be, very logically (and very sensibly) be against coal power stations. Clear coal is possible, but will only happen by government force. That’s in the distant future for the US, and far more so in China. Stopping use of coal is even less likely. Hence the need for research into replacements. It is an urgent task, as coal pollutes into so many different ways. So many destructive ways.